The Rotary Club of Chicago - Financial District was founded in February 1985. At the time, ours was only the second charter issued in Chicago since Rotary was founded in 1905. The club had its beginnings near O'Hare Airport. It was known as the Rotary Club of Chicago - New Chicago. Subsequently we migrated to downtown Chicago in the Loop. The Loop is in the heart of Chicago's business district. It takes its name from the circumnavigations of the elevated train system, the "El". Paul Harris' office, where Rotary was started, was in the Unity Building (since demolished) at 127 N Dearborn. was also within the boundaries of the Loop. As our club found its new home in Chicago's financial district, the name was updated. Since the move down town, we have held our regular meetings in historically significant locations. These included the Midland Hotel (now the W Hotel City Center) and the original Berghoff's Restaurant (now 17 West at the Berghoff) both buildings are still standing and may be seen at 172 W Adams and 17 West Adams respectively. Presently, the club's weekly luncheons take place in the Union League Club at 65 W. Jackson. Our meetings begin promptly at 12:10 p.m. and end at 1:15 p.m. and our members include professionals from many business sectors including banking, law, real estate, education, technology, and non-profits. We frequently have out-of-town and out-of-country guest and visiting Rotarians at our lunches and hope to see you at our club soon. 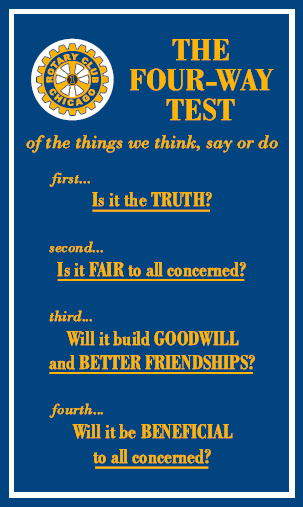 Rotary, founded in 1905 right here in Chicago, is a worldwide organization of business and professional leaders that provides humanitarian service, encourages high ethical standards in all vocations, and helps build goodwill and peace in the world. Approximately 1.2 million Rotarians belong to more than 32,000 clubs in more than 200 countries and geographical areas. Rotary clubs support community projects at home and abroad. Known as the world's largest private provider of international education scholarships, the Rotary Foundation funds more than 1,000 students annually to study overseas and act as ambassadors. Rotary also partners with eight prestigious universities around the globe to educate mid-career professionals in peace and conflict resolution.